This review has not yet been approved by the owner of this writing service. If you are the webmaster of Writemypapers.org, please Contact Us to approve or remove this review. This website is nothing special, but it does its job and doesn’t possess any notably annoying features. The price calculator is convenient and easy to use, you don’t have to register to see how much you are going to be charged, company’s policies are clearly described, the design itself is nice though not memorable. WriteMyPapers.org belongs to a lower than average price segment. Cost per page starts at $11.99 and rises up to $56, the latter being for a professional grade paper ready in three hours – much lower than one would expect for a work of this caliber. The price in general depends on two factors: how close the deadline is and the academic level of the work. Slides for PowerPoint presentations cost 50% of the cost per page. Available via Skype, chat, email and phone. Operators are quick to react to your queries and seem to be working 24/7, even on weekends. However, they certainly take their time answering the actual questions, but seem to be genuinely well-informed. Samples present on the website are rather nondescript and mediocre. Not awful, but certainly nothing to write home about as well. There are no blatant mistakes in spelling and grammar, but punctuation sometimes leaves much to be desired. Free revisions within 7 days after order completion. 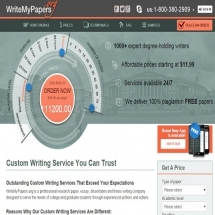 In all respects, WriteMyPapers.org is a completely average writing service, without any particularly damning or praiseworthy qualities – with the exception of unpleasant penchant for asking additional fees for virtually everything, even things like table of contents which is normally available as a part of the deal. Prices are low, perhaps a little too low for comfort – one can’t help wondering who is going to write on such conditions.